This guest post is contributed by Emily Thomas, who writes about top online colleges. She welcomes your questions and comments at emily.thomas31[at]gmail.com. To find out how to guest post on Own The Dollar, check out our guest posting guidelines. Simply because it’s in the stages of relative infancy, the online degree model is often viewed as suspicious by those who have been raised with the idea that a “brick and mortar” school–the ivory towers of academia–are the only places where one can receive a quality education. The problem with this logic is that it stifles innovation, and online education is all about innovation. The online education model is basically a response to the fact that our 21st century lives have become more technologically complicated, in almost every sense – whether it’s at work or at home. Attending a traditional university takes time and money, and, in a world where time and money are becoming increasingly rare (and thus, more valuable) resources, we must allot said resources more carefully. I’m certainly not one to argue that a traditional university is a waste of time. I myself attended a traditional university, and it was an unforgettable experience. However, my academic needs were slightly different than some (or most) people, because I did not initially have business aspirations – I first wanted to be a professor. For those who are more focused on clear-cut career goals – you know exactly what you want to do, you know what it takes to get there, and you don’t want to spend time “finding yourself” – then an online education is right up your alley. This is especially true of business-minded people, because you can have a full-time job while you get your degree. And now, in the current state of the economy, employers are placing a greater emphasis on experience, coupled with education. I myself had a hard time finding employment simply because I had no meaningful experience, even though I could talk at length about Shakespeare. Online degrees are generally cheaper and less-time consuming, although successfully working on an online degree takes a considerable amount of self-discipline, since you won’t have a physically present professor to constantly remind you of deadlines. Many online classes don’t have frequent deadlines, meaning you’ll have to consistently study on your own. 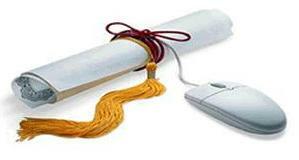 If, however, you possess the sort of driven, do-it-yourself mindset, then an online education is ideal. If you are really interested in a fast-paced, modern education, then you will have to do your research, since online universities are a dime a dozen, and many aren’t accredited. For more information about accreditation and other things you’ll need to know before going the online route with your degree, read last year’s Own The Dollar online college degrees resource article. Side Note From Hank – I have had the benefit of both a “brick and mortar” and online college education. Both of these degree programs have their benefits and negative elements associated with them. Like the infusion of Facebook and Twitter into our everyday lives, both work and private, I think that we will continue see online degrees become more and more popular, mainstream, and accepted.